Vivian Was Here: What's for dinner? 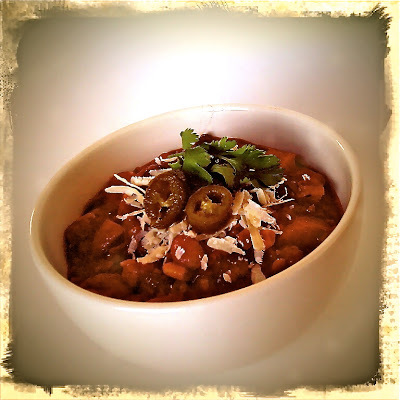 Today I'm sharing my favorite chili recipe with you. It's very simple so no chance of ruining it. Even though the weather has been getting nicer and I usually cook this hearty dish in winter only, this is still comfort food that goes for almost any day of the year. 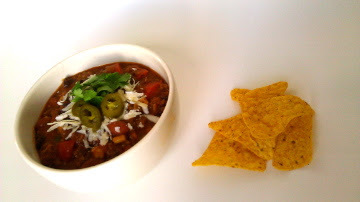 A lot of people will argue that you are not supposed to add beans, or corn, or whatever kind of ingredient to chili. But this is my favorite, and it has all those things! These are the ingredients for about 4 people. In a large pot, add olive oil and warm over medium heat. Add beef and onions and saute for a few minutes until the onions are translucent and the beef is starting to brown (but not too brown. It's not supposed to get dry). Add all your garlic and peppers and saute until the veggies have softened a bit. Be careful not to burn anything, especially not the garlic. Add all your spices and powders, and add the red pepper paste. Stir until all is coated in the paste. Add tomatoes, black beans, kidney beans and corn, stirring well to combine. Add hot sauce, salt and sugar. Stir in refried beans to thicken chili. Reduce heat to low and simmer for 45 minutes to let the flavors get all yummy. Done! Garnish and serve with nachos, bread or rice.